Revenge. 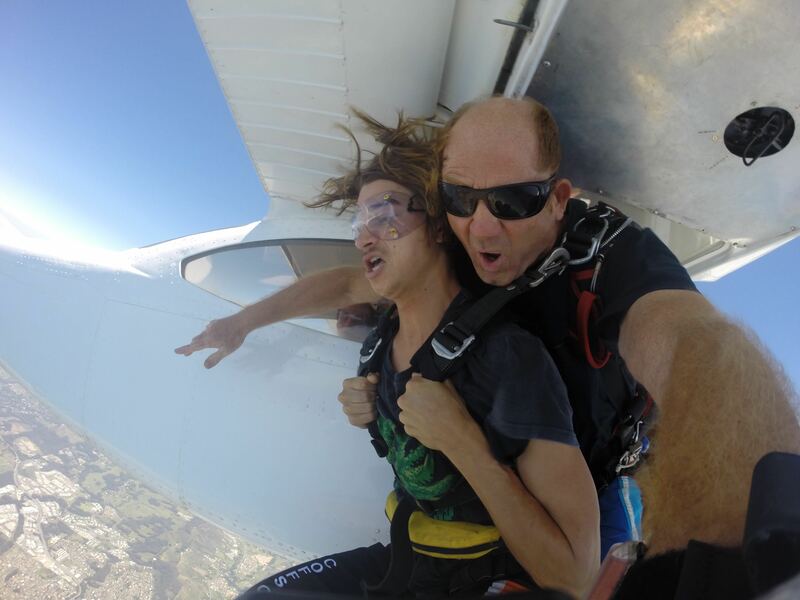 Whether it be on misbehaving teens, a mother or father-in-law, or your comatose partner, skydiving is the perfect way to get someone back for causing you grief… just throw them out of a plane, preferably at 15,000 feet so that suffering is prolonged. Or, maybe old age is creeping up on you and you want to shake those cobwebs collected over years of living in Groundhog Day. My mother is highly strung and freaks out if: you drive too fast; the waves are too bumpy on a boat trip; the dip on the kid's rides at theme parks is too steep, yet she celebrated her 65th birthday by jumping out of a plane. She even sang ♫Happy Birthday♫ to herself on the way down. The extra $$$ was well worth the money to have this moment caught on camera. 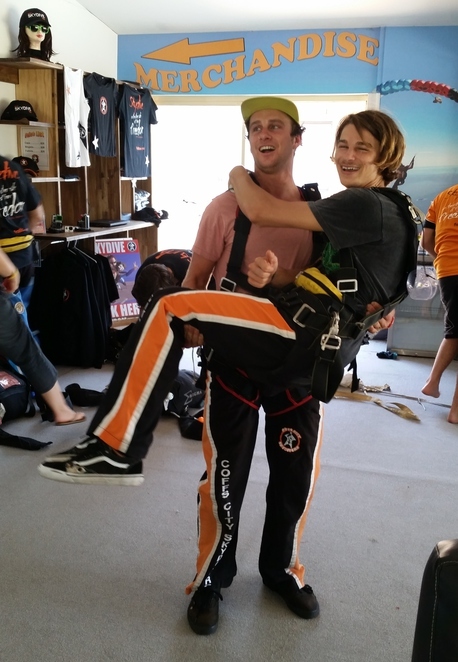 I don't ever remember threatening to throw my boys from a plane in their younger mischievous years, but somehow the idea seemed quite appealing when Christian's 21st and Dillon's 19th birthday came around within a week of each other. Christian is a natural born thrill-seeker and was dying to give it a go since he saw his grandma jump five years earlier. Dillon on the other hand would balk at the thought of jumping out of a plane so I kept it a surprise until an hour before the dive. 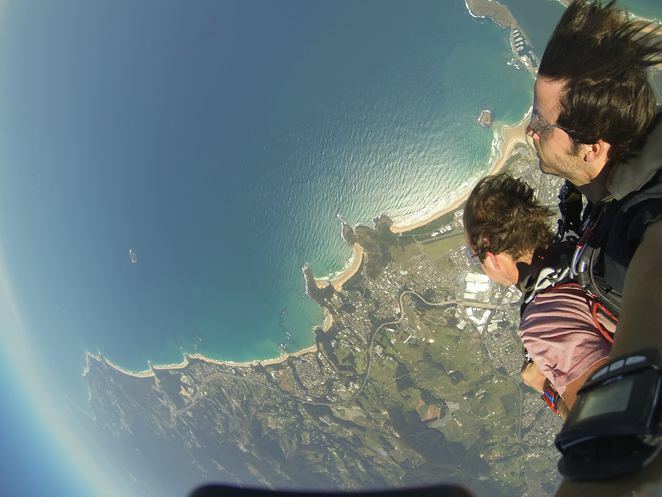 Coffs City Skydiving has been in operation for over 18 years and have logged over 20,000 skydives, with an impeccable safety record to boot. 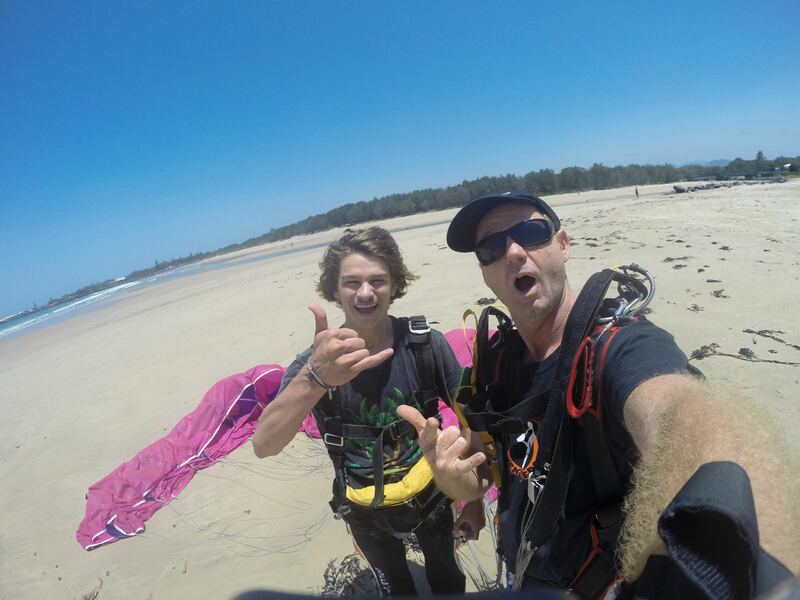 Their instructors are accredited by the Australian Parachute Federation and each come with a wicked sense of humour... a must when having to deal with panic stricken humans. 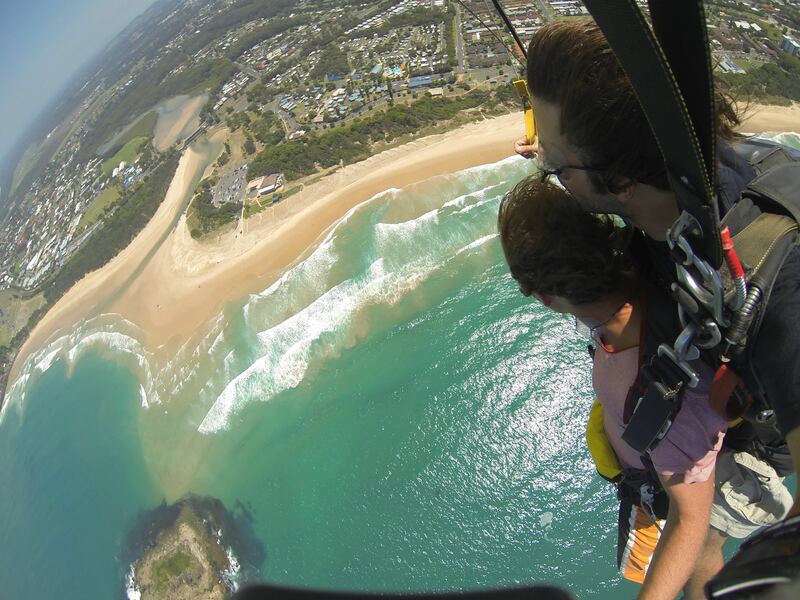 Coffs City Skydivers are located adjacent to Coffs Harbour airport. 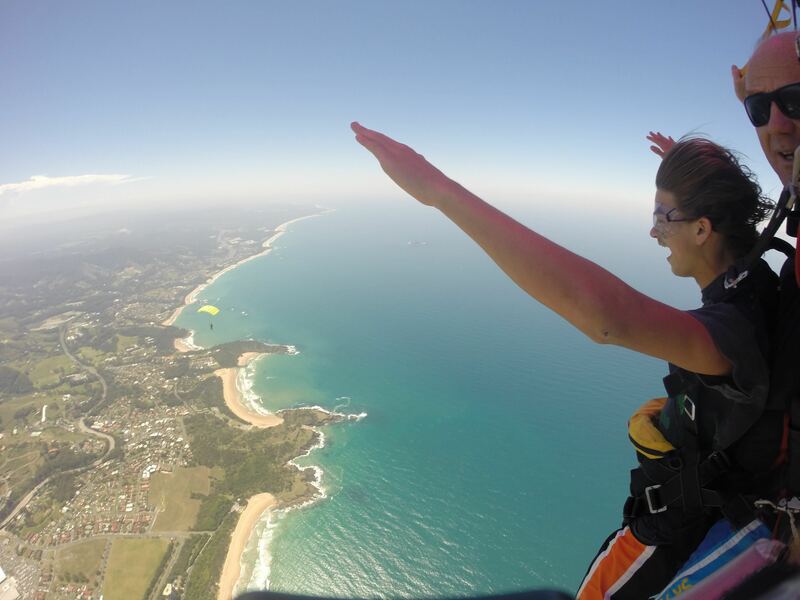 Take the first left after you turn into Airport Drive and follow the road along until you come to the Coffs City Skydiving premises. Since I was the instigator of the revenge, I'm acting simply as the reporter of this hair-raising experience. So, let the fun begin. I switched on my camera to record the reaction of my birthday surprise. As expected, Christian was itching for the thrill while Dillon did a 'no way', dance with quite amusing facial expressions beautifully captured on film. I made sure to invite friends along to witness the event and to ensure Dillon wouldn't back out. Yes, shame on me for taking advantage of peer pressure. I was prepared to jump in Dillon's place and deny someone the joy of taking out their revenge on me. The torture, or exhilaration in Christian's case, began on the ground with a twenty minute briefing and outfitting of harness and long pants (if you're going to land on the beach when it's a bit windy). Otherwise, the only requirement is that you wear closed in comfortable shoes. If you purchase the whole package, which includes photos and film footage, the filming begins during the briefing. We were all able to go to the airstrip and photograph or film them get into the teeny weeny plane, just big enough for 2 tandem divers and the pilot. I might add that even the pilot was wearing a parachute…just in case. I can't say that was a comforting thought. I think Dillon was too nervous to notice. 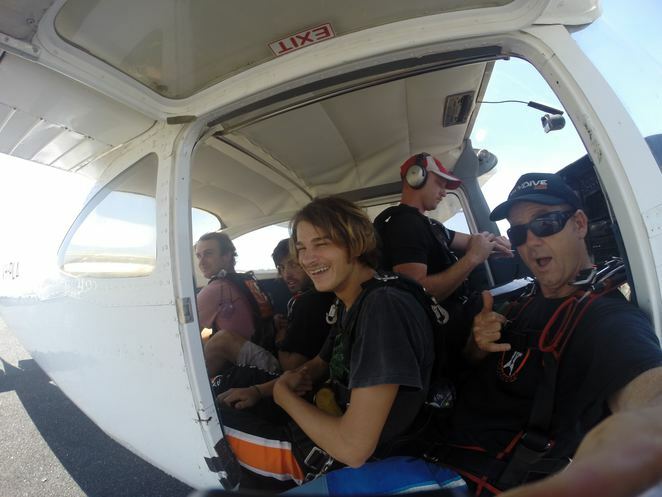 'Jumping out of an airplane was not something I ever wanted to do. I was not happy when my mum surprised my brother and me because I'm afraid of heights. When I got in the plane and we got higher and higher I was pretty calm until the door burst open. Then I started freaking out. I looked at Christian and said, "I don't wanna do this." 'As soon as Dillon jumped out we moved out quickly and jumped within seconds, not really giving me time to think about the situation. You do a forward flip out of the plane. The best part was free falling when you first jump out. It feels unreal, like no other feeling I've felt before. The acceleration was amazing. The rush of air through my nostrils made it hard to breathe until the parachute opened and eased the intensity of the fall. 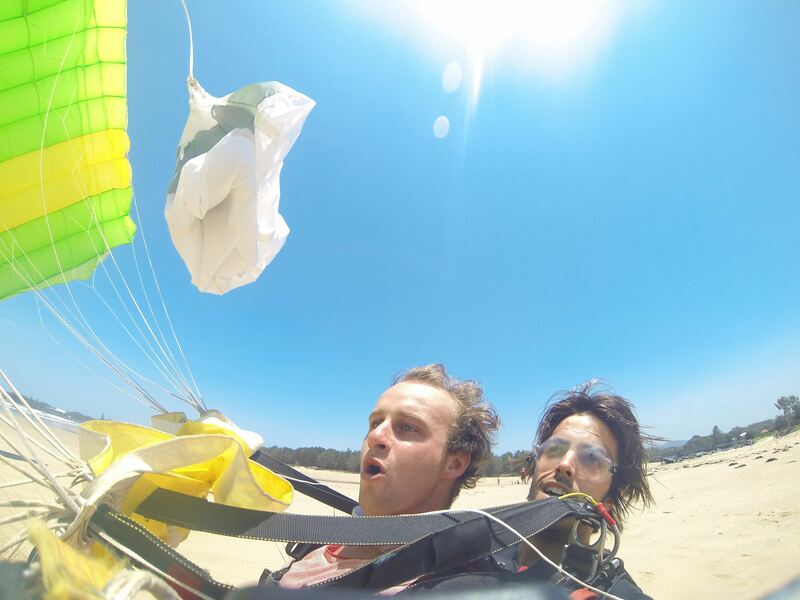 Once the parachute opens you get the feeling as if you're floating. The sensation is hard to explain unless you've done it yourself. You feel as if you should be falling faster but you feel the resistance of the parachute pulling you back. And so they both landed, safely on the beach. The look on their faces made me realise there was no revenge. It was the best experience of their life. The rush of emotions spoke volumes and those of us that missed out were envious. Everyone who's skydived will tell you it's a life changing experience. It's too bad that I only get to write about it from the comfort of my very stable chair. But hey, I'll be booking myself a sky dive for my 65th birthday, just like my mumsie. It's on my bucket list. Is it on yours? Why? 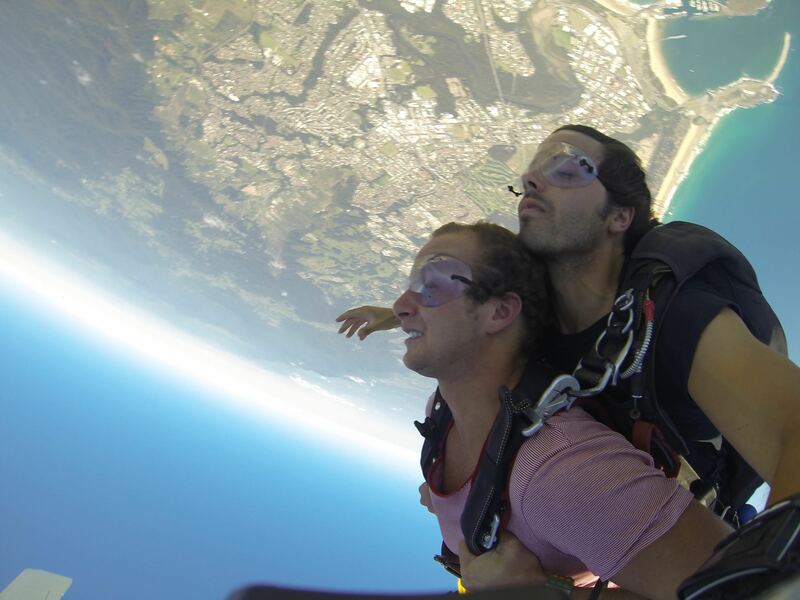 If you want a hair-raising experience with a million dollar view. This made me remember how great it is to be floating to earth.